Director David Yates returns with another movie in J. K. Rowling's Wizarding World, Rowling also returns as the screenwriter for this movie. Yates has directed six of the ten movies released so far starting with 2007’s Order of the Phoenix. It should come as little surprise that, by this point, the director has slid into a groove with these movies. Or perhaps Warner Brothers is taking the Marvel approach and trying to make sure their universe works as a whole and doesn't feel like several completely different movies. Rowling has already stated that the Fantastic Beasts series will consist of five films. Grindelwald feels like part of a work that is still in the set up phases so it should be interesting to see where she takes the story, though viewers already have a general idea of the direction things will go since this is a prequel. Following the events of the first Fantastic Beasts movie, the titular Grindelwald (Johnny Depp) has been locked in prison. 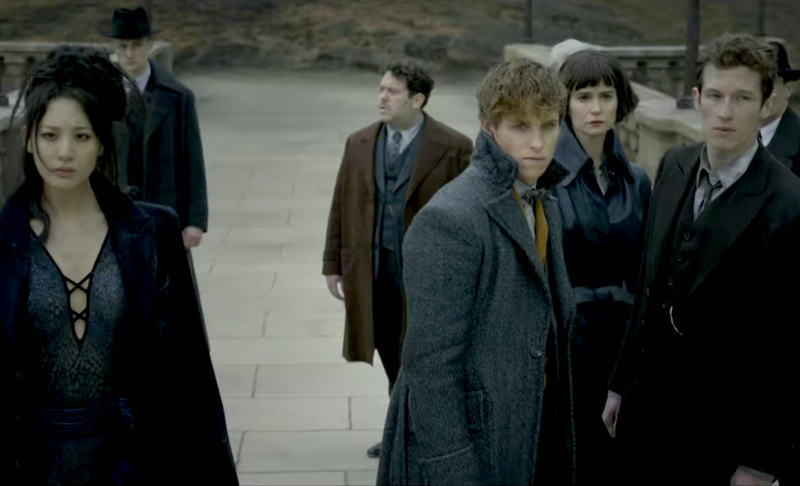 While being moved, Grindelwald manages to escape and begins to look for followers and to search for Credence (Ezra Miller). Meanwhile, the Ministry of Magic attempts to convince Newt (Eddie Redmayne) to join his brother, Theseus (Callum Turner), as an Auror. Dumbledore (Jude Law) enlists Newt's help in finding Credence in Paris. Tina (Katerine Waterston), already in Paris in search of Credence, is joined by Yusuf (William Nadylam) who is also looking for Credence. As with the first movie, the acting ensemble is excellent. While no performances here stand-out, there are none that stick out like someone is trying to steal the show though some of the characters are still more appealing and interesting than others. The relationship between Alison Sudol’s Queenie and Dan Fogler’s Jacob, whose unexpected visit to Newt leads to them being caught up in the events of this movie, still seems to resonant best amongst the cast. The two actors have good chemistry, giving their on-screen relationship an honest and realistic feel. Redmayne does well at portraying a man who is humble, a bit shy, and lovesick, still pining for Tina who thinks he is engaged to another woman - Leta Lestrange played by Zoe Kravitz. The Crimes of Grindelwald, like most fantasy movies, heavily relies on CGI to tell its story and like most other fantasy movies some of these elements work and others do not. As in the first Fantastic Beasts movie and the Harry Potter series, there are multiple magical creatures that appear on the screen. Several of the creatures really do look fantastic in this movie - the best looking to me is a lion / Chinese dragon. Then there are those that have not been well integrated into their surroundings and call attention to the fact that the actors are not actually interacting with them - some cat like creatures that show up later in the movie. By now movie goers know whether or not they are going to enjoy a movie in the Wizarding World and can probably gauge for themselves whether or not they want to spend the time and money watching one. While Fantastic Beasts: The Crimes of Grindelwald offers nothing new in this fantasy series, those wanting to find an escape for a few hours will find they will enjoy the return to this universe.